sorry I haven't been on to update in a few days, been getting my head around XtrakCad as I do not have a licence for anyrail and cant finish my plans. I have a question for those that have used XtrakCad. How do I import the Peco Flexitrack stuff into it? it does not seem to be on the pre-populated list when you download it. Tried that dude, no Flexi track also the points only connect at the long edge . So this is what i have so far, and until i buy antrail, i cannot add any more track or objects to it. 3D view, ignoring bottom left corner of 3D view. Are you sure this siding is long enough? End2end wrote: Are you sure this siding is long enough? For just the loco it should be fine I think but I can alter that when I begin to build. It is there so I can simulate a Loco Change for the train on that platform to the other and then a shunter will come in and take the coaches away to be cleaned ready for the next train. Other than that, does the plan look ok? I actually worked out I can probably go out by 4ft on that side and still have the room needed. which would mean I could make a 4ft by 7ft baseboard with a bottom L 3.5ft by 3.5ft. With that in mind, I could actually put a loop on the 7ft by 4ft board, couldn't I? Have you tried designing the layout in SCARM? I just wonder if it would give you more exact track measurements than Xtracad. Or be easier to use? I reckon you could, even just with the free amount of pieces they give you without having to buy the program. Don't use the Hornby offering though. It's well off scale. End2end wrote: Have you tried designing the layout in SCARM? Thanks for the tip, I'll take a look at scarm. To be honest I'm thinking of buying anyrail though as I'm used to it sort of now and I really like it. I just drew it out on paper with the measurements I planned using 4ft boards, while it would be an awesomely big layout, there is no way I could reach the other side to work on it as I would have no access to build or maintain. So I am going to stick to my latest plan of the end to end for now until I have a space big enough for my dreams! Once I have bought Anyrail, I will look at finishing the plan. Priced up my timber today too! I can't wait to get my baseboards done so I can actually start my layout! I plan to youtube it after I have built my baseboards to once I begin I will be sure to link in to here too. sorry, I haven't been in touch much but a stroke of luck has come my way! We are clearing our the patio area of our garden as we do not use it, and the wife has granted her blessing for me to put an 8x6 shed out there! So the plans have changed drastically! So my plan is, get the shed Asap, stain the outside, or maybe even paint it (thinking signal box style!) 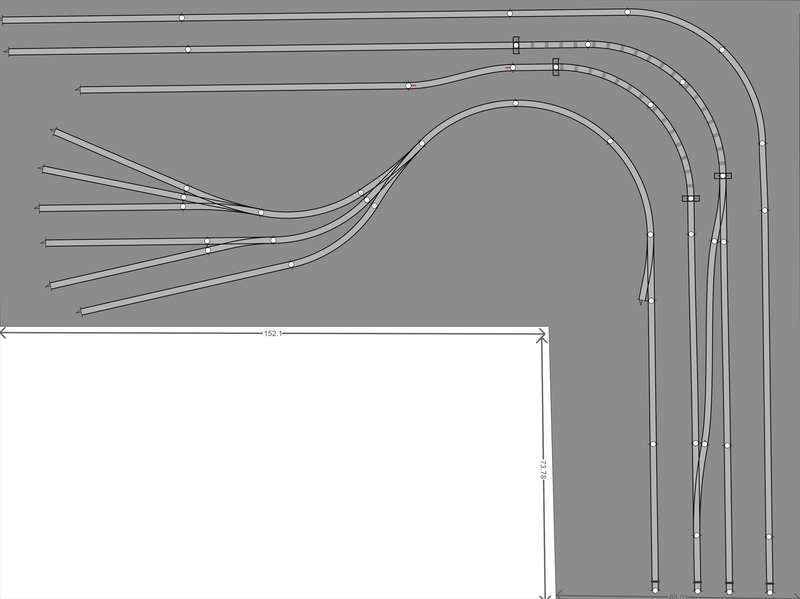 and build my layout in there, a full 8x6 layout with a centre point where I stand and operate! So I will come back with a new plan once I have the shed and I will upload pictures of the finished product!